Note: Enter the code into the promotional code box at signup to get the full discount. There’s a very good coupon code deal on Photo albums and online printing via Photobox. Photobox make high quality canvasses, aluminium prints, Photo books, Photo mugs and jigsaw puzzles. Here’s a coupon code you can use to get even better savings. Just use the link below, create your album or prints and type in FIFTYOFF at the checkout. Any order over £40 gets a whopping 50% off! GoDaddy 99 cent domains are back! Yes, GoDaddy 99 cent domains are back with this simple method and coupon code for December! It’s limited to 3 per account but does include existing GoDaddy account holders to purchase. I’ll show you below how to mix it up and get 6 domains for as low as $4. Start off by opening GoDaddy using this link (opens in a new window). Sign up or login if you are already a customer. First off, if you are from any country other than the US, set your primary currency to dollars. I’m outside the US but I keep it in this currency as it’s often where the better deals are. Search for your 3 .com domains and add them to your basket. Set all domains to 1 year duration using the dropdown menu. Click the little ‘Add’ link for each one, this will add the free .info to your basket. Verify your domains and that the corresponding .infos are all there, you should have 6 domains in total. At their current non-discounted prices (and GoDaddy are reasonable for their full-price domains) the basket would cost $82 for those 6 domains. Using this trick it comes down to a shade over $4. 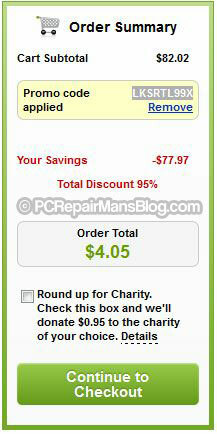 That’s a $78 dollar saving, or 95% if you prefer! Yes that really is just over $4 for 6 domain names!! Bookmark this page and check back for new codes before purchasing any domain! Go straight to GoDaddy and register your domains now (link opens in new window). The fantastic Niche Site Platform from Affiliate Wizard has now been updated and their latest, greatest version of this store building software is really quite impressive. GoDaddy cheap domains are unstoppable with these hard-to-find coupon codes. These great offers allow existing GoDaddy account holders to purchase as well as new accounts. Just copy the codes above and be sure to click the blue link which takes you to the purchase page. Go straight to GoDaddy and register your domains now before the offer expires (link opens in new window). Reviewing Market Samurai is difficult without comparing it to similar products. The problem is, there are very few to choose from that are in its class. Most people will barely touch on all the key functions that it has to offer. As a keyword research tool it really excels and if you need to research a market to completely dominate it then there is no better product currently available that does all that Market Samurai achieves. If you know the power of this tool and arrived here simply to get promo discount codes then their current offer is really quite excellent but well hidden. Download the free trial of Market Samurai from here. Try it free to make sure you like it then purchase the full version immediately and watch the price drop by over $50! That’s a huge 35% off the retail price. I have been running this tool since the early days of its launch and have seen it grow into a full-featured app. Powered by the very slick Adobe AIR platform, it looks like no other tool out there. I have tested it quite thoroughly, running on these systems: XP, Vista, Windows Server 2003, 2008 and Win 7 and it looks identical and runs smoothly on each. It interfaces seamlessly with Google, even offering Google’s Captcha code in a slick way. Market Samurai enables you to find and target profitable niches with incredible accuracy but how does it compare to the competition? Well I have been a long time fan of Micro Niche Finder which is a software tool that does what it says on the tin. Comparing the two it is fair to say that both offer extensive keyword research. Results are far from identical but running the generated keyword lists from one and dropping it into the other gets highly addictive. And highly targeted. If I had to choose one I’d be happy with either! Give me two and I’ll guarantee to create a niche that works every time. I don’t want to detract from Market Samurai though. The ability to create a new project, run a series of exhaustive tests on keywords finding high traffic ones with relevancy, assess market competition and commerciality all lead to a rounded product with astonishing value for money. Downsides? Hard to think of any but if I’m pushed I’d say that the average beginner dipping his toes into SEO would need some hand-holding. That said, this side is more than covered with the impeccable support. Ticket systems, knowledgebase, forums, troubleshooter, video tutorials all help to get beginners quickly up to speed. Buy Market Samurai today if you care about ranking your site and researching profitable niche markets. 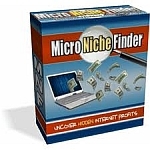 Micro Niche Finder is a very capable tool for drilling down into a niche market and finding relevant keywords. It is, without a doubt, the best software tool for keyword extraction currently available. That’s not to say it can’t be used with other tools and in my experience it works impeccably well alongside the free Google Insights. I reviewed Micro Niche Finder 5 which, at time of writing, is a huge improvement over the MNF 4. It brings the product in line with the ‘new’ Google search style and fixes some long-standing bugs with waiting times and product responsiveness. Micro Niche Finder allows you to drill down deeper than with any other keyword research tool currently available. It can check related keyword phrases, search Google Trends and more. You have the option to do broad or narrow searches and exact searches. The only other competitor on a par with this is Market Samurai (reviewed here) coming a respectable second in our tests with similar but not exactly the same keywords harvested from Google. I see this as an advantage of owning the 2 tools and I have run the output of one into the input of another on more than a few occasions where I needed extra insight into the keywords for a niche. Even beginners can harness the power of MNF with easy to visualise layouts and good documentation. Having invested in Market Samurai a while back, I still use it on many occasions but find myself ultimately coming back to Micro Niche Finder again and again. If you want to analyse your competitors’ websites then you have the tools in MNF to do this. You can investigate their backlinks (incoming links), anchor texts and the search engine results page to determine their authority. Want to check the profitability of your niche’s longtail keywords? Easy. The unique “Strength of Competitors” feature gives you all this and more. So are there any downsides? Well, I can only say that the price initially put me off. $97 for a product that effectively still required manual input and a bit of thought sounded a bit steep. But when I realised that the amount of time I spent researching niches had been cut so dramatically, I thought it through again. I now use Micro Niche Finder and Market Samurai to find all my niches and if this product was twice the price it would still be worth it and definitely in my armoury.